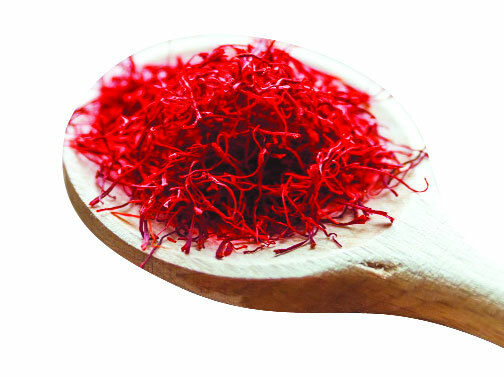 Saffron: Saffron is a small, bulbous, perennial spice, a member of the lily family. Saffron is a stimulant tonic and very effective to treat cold and fever; saffron mixed in milk and applied over the forehead quickly relieves cold. Saffron or Kesar has been hailed as the source of beauty and health since times immemorial. When consumed with milk it increases body's resistance and when mixed with cream and applied on face it makes skin clean, spotless and radiant. In winters it can be boiled with raisins, milk and almonds and taken daily before going to sleep. Saffron contains a dark orange, water soluble carotene called crocin, which is responsible for much of saffron's golden color. Crocin has been found to trigger apoptosis (programmed cell death) in a number of different types of human cancer cells, leukemia, ovarian carcinoma, colon adenocarcinoma, and soft tissue sarcoma. It is also useful in the treatment of age related mental impairment.